Shares in German sporting goods company Puma have jumped amid speculation that it is set to become takeover target. Puma shares ended 29.25 euros or 10.2% higher, at 315.24 euros, but traders said there was little sign as to which firms could bid. Puma did not comment. 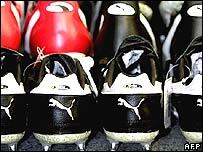 One firm that was being linked to Puma was French retailer and Gucci owner PPR. It also declined to comment. Puma, one of the world's biggest sports firms behind Nike and Adidas, has been under pressure from falling profits. In February, the company reported that its profits had fallen by 26% to 32.8m euros ($43m; £22m) during the final three months of 2006. However, most of the profit decline was down to higher costs linked to its expansion, and sales actually rose by more than a third to 480.6m euros. Puma also declined to comment on the market speculation.